So. I dropped past the Surgical Bookings office at the hospital today, just to see where I was on the waiting list for my hip replacement (cos using crutches all the time is getting old real fast). And they say "Well, you're Category 3a, so it could be a while yet ..." - WTF? Uh. NO. I very sweetly ask (honest, I didn't get mad, ask Dotter!) if they could check that, as I'm supposed to be Category 2a (ie much more urgent, condition deteriorating). And sure enough, there, tucked away in some file on their wretched computer, is the letter from my surgeon from July ... which they hadn't done anything about. So it's been fixed, and I have a rough date : November. Even if some Category 1 (ie super urgent) patients come onto his list, it'll only push me back a little. So the soonest would be in 6 weeks, the latest in 10 weeks. I'll still believe it when I see it. Yay for hospital bureaucracy, hey? And this is nearly done too, a Super Ben cape for my nephew Ben. I've actually finished the cape, it just needs an i-cord tie for the neck, and washing / blocking. He's nearly 4, and - more importantly - is about to become a Big Brother. This is for him when his new baby arrives in a few weeks. 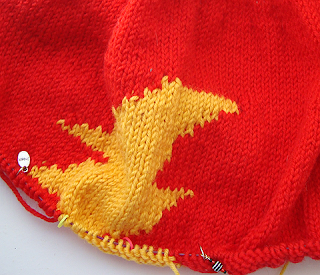 I haven't done intarsia for ages, this one was fairly painless. Pattern is from New Knits on the Block (Rav link). 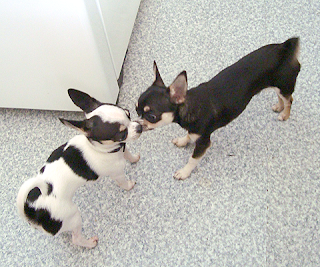 Young Petal had a play date with her sister Alexis last week, after being brave at the vet (heartworm vaccination). She's a whole 1.3 kg now (about 2.8 lb), and the vet thinks she's unlikely to get all the way to 2 kg! Much smaller than our last chihuahua, Lily. Fingers crossed for a sooner rather than later date for your surgery (lucky you checked in hey!). 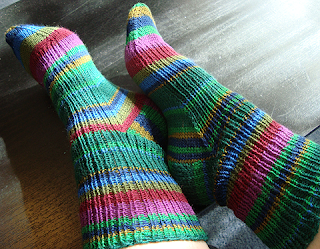 Love your KF socks - such a great colourway that one! That hospital thing is so frustrating! What if you hadn't checked in?! ARGH!!! Oh, and happy belated birthday, too! Well, argh! I'm glad you have such a cute puppy and knitting and work to get you through. You were SO smart to check in! Good luck on a surgery date. The socks rock. And the puppies are adorable! It's almost a book. The head is presenting. Push! Push!! Glad to hear you're getting closer to getting the much needed surgery - socks are lovely colors - puppy so adorable! I'm glad you dropped by and caught the error. Love the socks! Good to hear you're likely to have your surgery soon. And I'm very happy to hear you had a great birthday - you deserve it. YES! But wait until my box gets there! It's fantabulous! I found a brilliant present!